There seems to be a growing trend for writers to bundle a random number of different items into an article. Some examples: ’27 things we LOVE about Cardiff’, ‘Six teenagers who rocked the world’ and ’11 things humans do that dogs hate.’ I don’t know why others do this but I find it a useful device when my mind is blank and I can’t think of a topic that I really want to write about on my blog. It is sometimes easier to produce a list of snippets than to write a coherent article. So here are four things that have caught my eye recently. On Monday afternoon I saw that the U21’s game was to be played at St Andrew’s that evening and decided to go and watch it. I wanted to see our youngsters and thought it might cheer me up to watch a game where I didn’t care about the result. When Colchester United went ahead at the start of the second half I remembered that there is no such thing as a game where I don’t care about the result. I always care. Even if I watch a game between two teams I’ve never heard of before, I end up supporting one of them and caring about the result. I didn’t have too long to worry on Monday though. About ten minutes after Colchester went ahead, Denny Johnston scored an equaliser and Charlee Adams put Blues ahead from the penalty spot a few minutes after that. The best goal of the game came from Reece Brown, who lobbed the ball over the keeper with just over 15 minutes left to play. There was a lot to like about the game, including free entrance for season ticket holders, a free team sheet, shirts numbered 1 to 11 and a Blues team that played better in the second half than they had in the first. 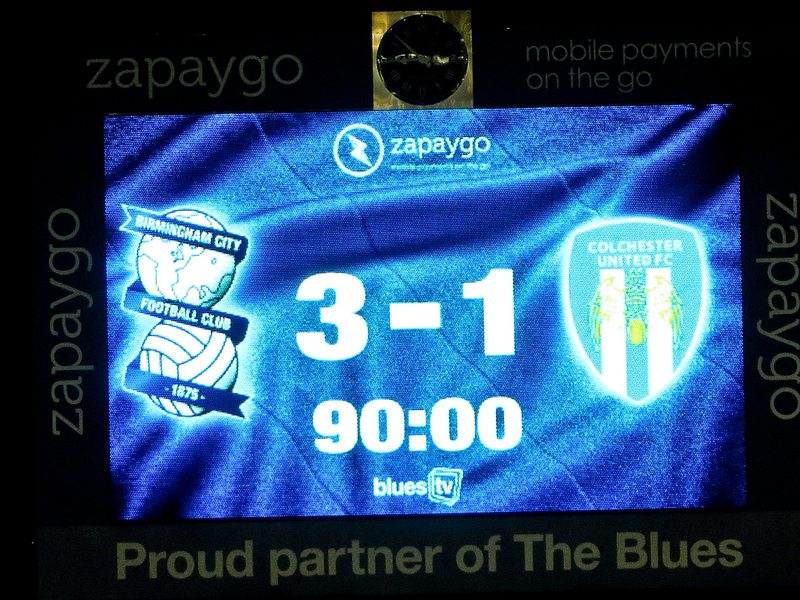 I listened to Radio WM’s commentary on Birmingham’s game on Tuesday night. My heart sunk when Millwall scored to make it 1-2 as I had been hoping for a clean sheet. Fortunately our players didn’t give up and ended up winning by the same margin as the U21’s had the previous night. Once the game was safely over I decided that it might have been valuable experience for the team to be two goals up and then be pegged back but hold on for the win. It sounded as though David Cotterill had had a great game and two of the youngsters had done well: Koby Arthur for seventy minutes and Will Packwood for the last twenty. Birmingham City fans are used to looking to Hong Kong for news but in recent days the whole world is watching and wondering what will happen there. As much as I care about my football club and would love fans to have a say in how it’s run, I do know it’s not the most important issue in the world. The demonstrators in Hong Kong are fighting for something far more important, for the right to vote for the political leadership of their city. Against that backdrop, Daniel Ivery and Will Giles have been promoting their book about Carson Yeung and his progress from hairdresser to football club owner and his conviction for money laundering. If you are interested and have the time to watch a long video (49 min 50 sec) you can watch their talk at the Foreign Correspondents Club. There has been a lot of talk online about what might or could happen when Peter Pannu’s contract ran out on September 30th. The club have confirmed his service agreement will not be renewed but this doesn’t seem to have brought any great changes yet. It’s best not to believe everything you read.